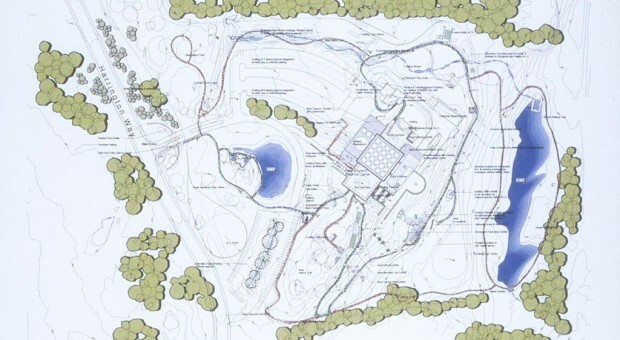 Michael Singer Studio was commissioned to provide a master plan for the expansion and re-configuration of the New England Science Center now known as the EcoTarium. The current facility was designed by Edward Durell Stone and built in 1968. The plan includes renovation of the existing main exhibition building, new exhibitions, outdoor animal habitat exhibitions, as well as new site planning for nature trails, parking areas, traffic circulation and reconstructed wetlands. The master plan was approved and resulted in the implementation of a $12 million phase 1 enhancement for the entire campus. Singer formed a team of architects, designers and fabricators to design and build multiple project areas within the master plan, including new construction as well as renovations. The mission of the EcoTarium is providing the public with an understanding of the role of ecology and natural systems in our lives. Singer’s designs for the project further this mission by regenerating ecosystems and sculpting spaces that engage a wide range of audiences to experience the campus’ landscape and exhibits. The existing main exhibition building was modified so that a central sculptural courtyard is viewed from the main exhibition hall. Singer’s Emerging Garden and Water and Ice Wall are the focus of this courtyard. In winter the garden and water wall are transformed by the forming and melting of ice that changes its appearance daily. The Water and Ice Wall is fourteen feet high and eighty feet long. In the summer the water’s mist serves as a cooling element and adds the sound of flowing water into the courtyard garden. Other landscape areas include the Timescapes Trail and Meadow Trail, outdoor exhibits, a pond pavilion and the low-impact development design and naturalization of new parking lots. Other indoor works by Michael Singer Studio included the new water exhibits, a complete overhaul of the gift shop and new furniture within the main exhibition building. The project was featured in an article about Michael Singer’s work, appearing in the New York Times Sunday Arts Section, and can be read here.